The news was first reported by Korean outlet SBS and later corroborated by KBS and national newspaper Hankook Ilbo. According to the SBS report, “Player A” had received a payment—allegedly in the region of 100million won—from a gambling broker to lose the fight, while it’s also noted he was set to win money on his opponent’s victory with a bet earning the fighter in question, along with the fixer, 50million won between them. The report goes on to say the heavy amount of money placed on Player A’s opponent drew the attention of senior UFC officials, who contacted the fighter and his team to ensure no nefarious activity was at play as was suspected with such aggressive action being unexpectedly—and suddenly—placed. The fighter involved is said to have played oblivious to the allegations at the time. After the UFC’s intervention, the report suggests the fighter decided to compete as normal through fear of repercussions from the police now he had been notified how the betting activity had aroused suspicion. It’s noted the fighter went on to win a decision against his American foe, but didn’t appear too happy about that fact once having his hand raised. After the unplanned victory, Player A is said to have been intimidated and has received numerous threats from the shady characters involved in the fight fix—prompting him to speak to the police. The International Criminal Investigation Division of the Seoul Metropolitan Police Agency is now investigating the fighter involved and are pursuing the gambling brokers who planned the fight fix. The original SBS report didn’t name the fighter at the centre of these allegations, they instead simply named him Player A and a “South Korean fighter”—including detail of his opponent being American. 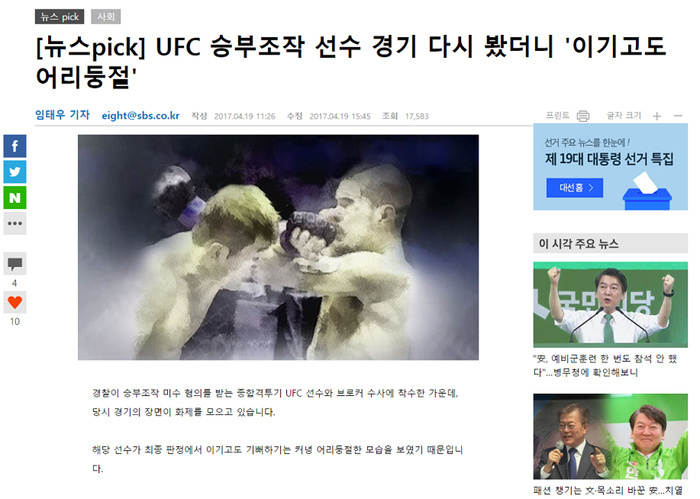 However, the article displayed an altered photo of Tae Hyun Bang and American Leo Kuntz mid-action as its lead image. Meanwhile, KBS named Bang outright as being the figure involved. In addition, it just so happens Bang is the only male Korean to have won a decision over an American opponent that night and, aged 34, he is the only Korean fighter matching all articles’ thinly-veiled descriptions. Bang defeated Kuntz by split decision with scores of 29-28, 29-28, 28-29, going in his favour thanks to an early knockdown. At the time, BloodyElbow picked up on the fight’s irregular betting patterns just hours before the event had started—patterns which saw Kuntz move from a slight underdog to a heavy -475 favourite in the space of two hours thanks to the money heaped on him to win. Bang, a former DEEP lightweight champion, has a record of 18-10 and hasn’t fought since his unanimous decision loss to Nick Hein last September—his first fight since Kuntz. 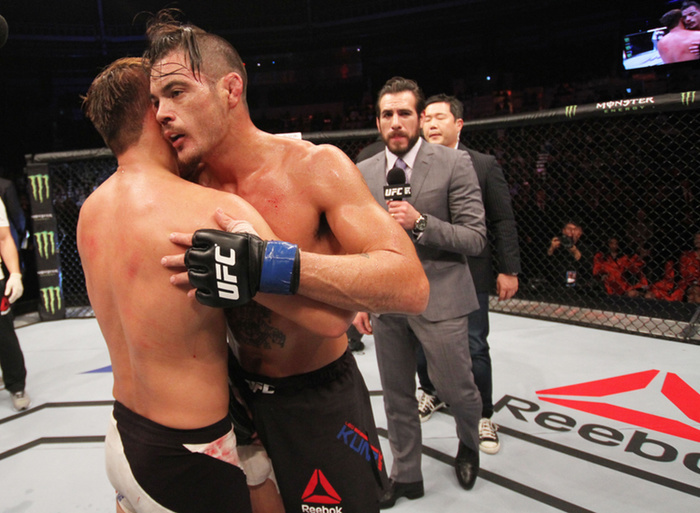 He is 2-3 in the UFC, having beat Kuntz and Kajan Johnson, while losing to Hein, Jon Tuck and Mairbek Taisumov. The five-fight UFC veteran was tentatively scheduled to visit Saipan, one of the Northern Mariana Islands, last week to stay and train at gym Trench Tech. But the trip was “postponed indefinitely, until further notice” due to “undisclosed reasons” as confirmed by message from Korean Top Team, according to local newspaper Marianas Variety.